Please refer to our stock # 11146 when inquiring. This sophisticated vintage necklace was made for the couture line of Giorgio Armani. The necklace has a 37" end to end measurement with an 11 1/2" center drop, and can be tied at various lengths. 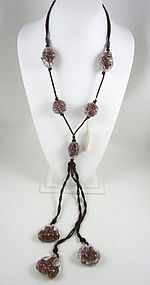 It has crackle resin beads strung on a silk cord and has it's original paper drop tag. It is also marked with the "GA" metal drop tag on the end. It is in excellent condition unworn condition. This is not from the emporio collection, but the high end "Armani Collezioni".